Find all of the technical information articles displayed in alphabetical order. Learn how to calculate several spring specifications such as spring rate, load, travel/deflection, coil count, and much more. Our most helpful/popular articles will be highlighted for easy browsing. Click on a title below to read more about the subject. What Affects the Life Cycle of a Spring? Info! Please fill in one or more fields to narrow down your search. Definition: Compression springs are helically coiled round wires shaped with pitch in between each coil. They are used to store energy when compressed and to release that energy when a load is released. Note: Click on the highlighted titles to learn more. The cylindrical shape of a compression spring due to the three-dimensional form of its round/circular coils. The thickness of the round wire which the compression spring is made of. The thickness of the coils that form the compression spring’s body. The width of the inside of the coils. Calculate by subtracting two wire diameters from the outer diameter. The medium or intermediate diameter that is located right in the middle of inner diameter and outer diameter. Calculate by subtracting one wire diameter from the outer diameter or by adding one wire diameter to the inner diameter. The free, unloaded length of a compression spring. The total amount of coils including open and closed coils. The active amount of coils including only open coils with pitch in between them. The distance between your spring’s coils. Because there is pitch in between the coils, the wire which the coils are made of rises. This is the measurement of how much the coil is raised. All coils of the spring have pitch in between them, including the edges. The length/height of your compression spring when it is fully compressed and all of the coils are touching. You calculate this value by multiplying the wire diameter by the total coils and adding one more wire diameter. In the case that your compression spring may have ground ends, you will only multiply the total coils by the wire diameter. The proportional ratio between your spring’s wire diameter and mean diameter. It specifies the tightness of your compression spring’s coils. The compressed length/height of your spring when a load has been placed on it. The motion in which a spring is compressed. The distance traveled is the difference between the free length and the loaded height. The force being applied on the spring in order for it to travel. 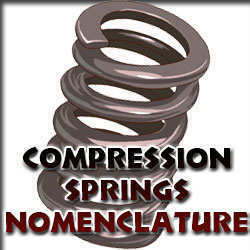 The maximum travel of your compression spring considering its solid height as to not exceed it. The maximum load of your compression spring considering its solid height as to not exceed it. The travel you might be able to achieve out of your spring if you were to make the free length longer. To calculate how much you are able to increase the free length, subtract the “Max F” from the “True Max F”; the result will show you how much free length you’ll be able to add to the compression spring. If this value is equal to the maximum travel considering solid height, you will not be able to add any more travel. The load you could be able to get out of your compression spring if you increased the free length. To calculate how much longer your free length can be, subtract the “Max F” from the “True Max F” and add anything less than or equal to the result to get more load out of your spring. If this value is equal to the maximum load considering solid height, you will not be able to add any more free length. Maximum stress at which your compression spring will perform indefinitely without failure for a given minimum stress limit. The action of a compression spring bending to the side after being compressed due to having a long free length in proportion to its mean diameter. The product of exceeding the elastic properties of a compression spring thus keeping it from returning to its original free length once the load has been released. INTERNATIONAL SHIPPING IS AVAILABLE, CONTACT US FOR PRICING. Copyright © by Acxess Spring. All Rights Reserved.